The global unified threat management market has risen at a steady pace in recent years due to the rapid rise of cybercrime and the importance of cyber security in today’s enterprise world. The rising threat posed by cybercrime is likely to ensure stable demand from the global unified threat management market in the coming years. The steady advancement of digital tools to handle cybercrime and the increasing support in the corporate sector for widespread adoption of advanced security methods is likely to drive the global unified threat management market at a rapid growth rate over the 2017-2022 forecast period. North America is likely to remain the most lucrative regional market for unified threat management market players over the 2017-2022 forecast period due to the widespread incorporation of technological means to support sophisticated cyber security protocol. According to Transparency Market Research, the global unified threat management market is expected to reach a valuation of US$3.4 bn by the end of 2017. The unified threat management market is projected to exhibit a strong 11.1% CAGR between 2017 and 2022, enabling the market’s growth to a valuation of US$5.8 bn by the end of 2022. By component, the global unified threat management market is bifurcated into software platforms and support services. Of these, software platforms are likely to remain the dominant contributor to the global unified threat management market over the 2017-2022 forecast period. The software platforms segment is likely to be valued at more than US$2.8 bn by the end of 2017 and further rise to more than US$4.9 bn by the end of 2022, exhibiting a robust CAGR of 11.8% therein. The share of the software platforms segment in the global unified threat management market is thus expected to increase from 82.3% in 2017 to 84.9% in 2022. Regionally, North America is the leading market for unified threat management market players. The widespread awareness in the region about the importance of cyber security in the modern digital age is likely to ensure stable growth of the unified threat management market in North America over the 2017-2022 forecast period. The North America unified threat management market is likely to be valued at US$1.2 bn by the end of 2017 and further rise to US$2.1 bn by the end of 2022. The unified threat management market is expected to exhibit a strong 11.6% CAGR in North America over the 2017-2022 forecast period. Apart from North America, Europe, Japan, and Asia Pacific except Japan are also likely to make a notable contribution to the global unified threat management market over the 2017-2022 forecast period. The unified threat management market in Japan is expected to exhibit a robust 14.2% CAGR between 2017 and 2022, reaching a valuation of US$971.1 mn by the end of 2022. The Japan unified threat management market alone is likely to be valued more than the APEJ unified threat management market by 2022, with the latter expected to be valued at US$809.7 mn by the end of 2022. Leading players in the global unified threat management market include Check Point Software Technologies Ltd., WatchGuard Technologies Inc., Juniper Networks Inc., Cisco Systems Inc., IBM Corporation, Huawei Technologies Co. Ltd., Fortinet Inc., Hillstone Networks Inc., SonicWALL Inc., and Comodo Group Inc. The global unified threat management market report provides a comprehensive look at the market’s growth patterns in recent years, thus enabling readers to make successful strategies based on the likely trajectory of the market over the 2017-2022 forecast period. Historical information regarding the global unified threat management market’s growth is thus provided in great detail in the report, with the report assessing 2012-2017 growth figures of the leading segments of the global unified threat management to understand their current position and growth prospects in the coming years. The major drivers and restraints affecting the global unified threat management market and the key players operating in the market at present are also profiled in detail in the report. According to Transparency Market Research, the global unified threat management market is likely to reach a valuation of US$3.4 bn by the end of 2017 and further rise to US$5.8 bn by the end of 2022. The unified threat management market is projected to exhibit a strong 11.1% CAGR over the 2017-2022 forecast period. 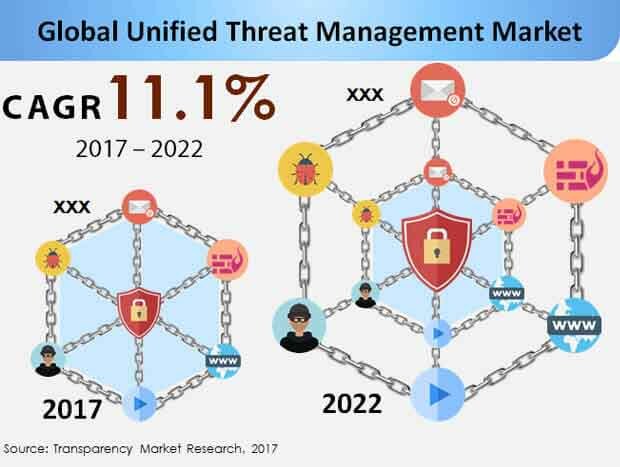 The global unified threat management market’s growth is marked by several influential factors, which are likely to play a determinant role in the market’s growth in the coming years. The report takes a comprehensive look at the various factors influencing the unified threat management market’s growth by assessing its qualitative and quantitative impact on the market. Solid projections regarding the impact of the driver on the market over the 2017-2022 forecast period are thus provided in the report to enable market players to understand the factors likely to hinder and drive their expansion in the unified threat management market in the coming years. The rising threat of cyber crime at the national as well as institutional level is likely to ensure stable demand from the global unified threat management market in the coming years. The report sheds light on the granular structure of the global unified threat management market by profiling the performance of its leading segments over the 2012-2017 study period. The report segments the global unified threat management market by component, end use vertical, and enterprise size to understand the composition of the market at the granular level. The report segments the global unified threat management market is segmented by component type into software platforms and support services. By end use vertical, the global unified threat management market is segmented into IT and telecom, BFSI, government, healthcare, manufacturing, and others. By enterprise type, the report classifies the global unified threat management market into large enterprises and small and midsized enterprises. In order to understand the global distribution of the unified threat management market, the report studies the 2012-2017 performance of the UTM market in North America, Latin America, Europe, the Middle East and Africa, Asia Pacific except Japan, and Japan. The report provides extensive analysis of the historical performance of these segments of the unified threat management market as well as reliable predictions regarding their likely growth trajectory over the 2017-2022 forecast period. The report provides a detailed look at the competitive strategies being employed by major players in the global unified threat management market and the degree of success they have found in recent years. The geographical presence and product catalogs of the leading players in the unified threat management market are also assessed in the report. Key unified threat management market players profiled in the report include Check Point Software Technologies Ltd., WatchGuard Technologies Inc., Juniper Networks Inc., Cisco Systems Inc., IBM Corporation, Huawei Technologies Co. Ltd., Fortinet Inc., Hillstone Networks Inc., SonicWALL Inc., and Comodo Group Inc.